Though he was nearly 7,000 miles removed from his fieldwork being conducted in the Philippines — and roughly 5,500 miles away from his desk at the UC San Diego School of Global Policy and Strategy (GPS) — Nico Ravanilla couldn’t have been more engrossed in his research while at the University of Oxford’s Summer Research Institute. 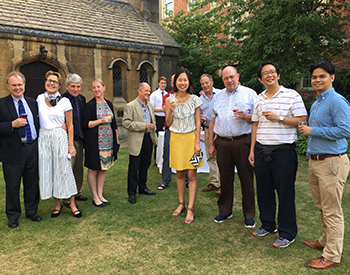 The assistant professor at GPS whose work spans the political economy of development, governance and policy analysis, stole away during the first week of July to the retreat, which welcomes one academic or senior administrator from participating institutions to Oxford’s Harris Manchester College each year to undertake research or finish writing a project. Assistant Professor Lauren Prather attended in 2016 on behalf of GPS. Following his extended stay in U.K. and return to the Philippines, we connected with Ravanilla for details on his time across the pond. Here’s what he had to say. What specific research or project did you focus on while at the Summer Research Institute? I focused on two research projects. The first project analyzes the central role of political brokers in clientelist exchange (i.e., the contingent exchange of money for votes). Even though brokers are regarded as the lynchpins of clientelist campaign machines, little is known about whether and why they are effective at mobilizing electoral support for their candidates. In this project, my co-authors and I took advantage of a rare opportunity to work with a local campaign machine in the Philippines and undertook one of the first efforts to systematically analyze the central role of brokers. I took advantage of my time at the institute to really focus on drafting the manuscript and reporting the results of the project. The second project investigates whether community-oriented policing can sustainably increase citizen trust in the police and improve the effectiveness of police services. July 2-9 was the ideal window of time between the first and second phases of this large-scale field experiment on community-oriented policing in the Philippines, which is sponsored by GPS’s Policy Design and Evaluation Lab and Evidence in Governance and Politics. While my collaborators — two Ph.D. students in UC San Diego’s Department of Political Science and Adam Schaar, a 2018 MPP candidate at GPS — were in the field making sure the experiment was running smoothly, I flew out of the Philippines to spend a week at Oxford to literally get away from the field. Survey results had just come in from the first phase of the experiment, so I spent time running regression analyses to inform the design of the second phase of the experiment in time for its actual implementation in August. How did being removed from your normal workspace enable you to look at your research differently? In short, my time at the Summer Research Institute was time to write and reflect away from the School and research sites. I had never been to Oxford before. It proved the perfect place for a brief research retreat. My daily interactions over breakfasts and dinners with other fellows from all sorts of academic backgrounds and home institutions forced me to think about and communicate my research in a way that was understandable, for example, to an environmental lawyer, a social psychologist or an architect. Did you make any new connections or find new collaborators while abroad? 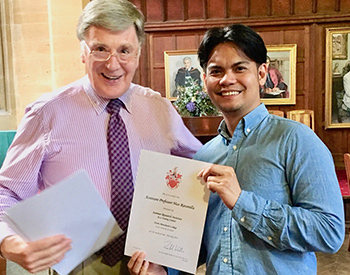 While at Oxford, I had the chance to meet with Julien Labonne, an economist working on the political economy of the Philippines, and other faculty at Oxford’s Blavatnik School of Government. Although our research projects have overlapping themes and we have been in contact via email for some time now, Julien and I have never had the pleasure of meeting in person. My coming to the institute was the perfect excuse for us to meet over lunch and coffee. And we did so a few times. Personally or professionally, what was the best part of your trip? Believe it or not, I have never been to Europe before. Although going to the U.K. is not quite the same as going to continental Europe, spending time at the Summer Research Institute meant I still got to check ‘see Europe’ off my bucket list. Since I was already in the U.K., I decided to go on a seven-day ‘shoestring budget’ tour of Great Britain. By the time the trip was over, I checked out all the popular destinations, from England to Scotland to Wales and made a busload, literally, of new friends. In sum, why are research retreats such as this important for faculty members? Especially for new faculty like myself, research retreats in the summer are revitalizing. I was reminded of how much I enjoy doing research — and only research. I very much enjoy teaching, especially at GPS since my interactions with students in and out of the classroom almost always lead me to rethink how I frame my research and how I can better communicate my findings to policymakers. But nothing beats doing research without distraction.